We encourage you to grab the beta and help us find any bugs or regressions with your code base and report any issues you find by following our contributor workflow. The documentation for 1.10 has not yet been built, though the API changes from 1.9 are minimal. Work in progress release notes are available to see a highlight of the additions we have made. Thank you to everyone that has helped make this release a success, including the 61 contributors that have had code land in this release! If you’re using Dojo 1.4, 1.5, or 1.6, you’ll need to update to the latest patch to fix a regression with the release of Chrome version 29. Ticket 17400 has the details on the fix. You can get the patch from GitHub for your particular version of Dojo, and this fix will be included in the next release for each of Dojo 1.4.x, 1.5.x. and 1.6.x. If you are already using Dojo 1.7 or newer, this fix already exists within your code base. I’m pleased to announce that after a prolonged period of incomplete mirroring, we’ve now fully migrated Dojo’s source code to GitHub. Future development will be performed there instead of the Subversion repository, which is now read-only and effectively dead. We will continue to use bugs.dojotoolkit.org for issue tracking, but patches should now be submitted directly as pull requests. The CONTRIBUTING.md guidelines in each repository provide guidelines on sending patches. As an unavoidable part of this update, the old repositories on GitHub have had their histories rewritten. This means that any Git projects with submodules pointing to those old repositories will be broken. If you have such a project, please make sure you update your submodules. The old mirror repositories have been temporarily renamed with an `-oldmirror` suffix so you can find the correct commit ID for your project. These old mirror repositories will be going away in the near future. Today, the Dojo Foundation board voted to approve a €500 match to the jQuery Foundation’s financial grant to the developer of UglifyJS, Mihai Bazon. This grant is being provided to help speed development of the next major version of the open-source UglifyJS code compression library, which is a significant rewrite designed to provide better extensibility for new features like source maps and more aggressive compression methods. (UglifyJS is planned to be the replacement for ShrinkSafe in Dojo 2.0.) We’re very excited to be able to provide additional assistance to this extremely important project, and hope that others will be inspired to pitch in as well. Together, we can do amazing things! The Dojo team is very excited to announce the immediate release of Dojo 1.8, our last major release before the big 2.0! 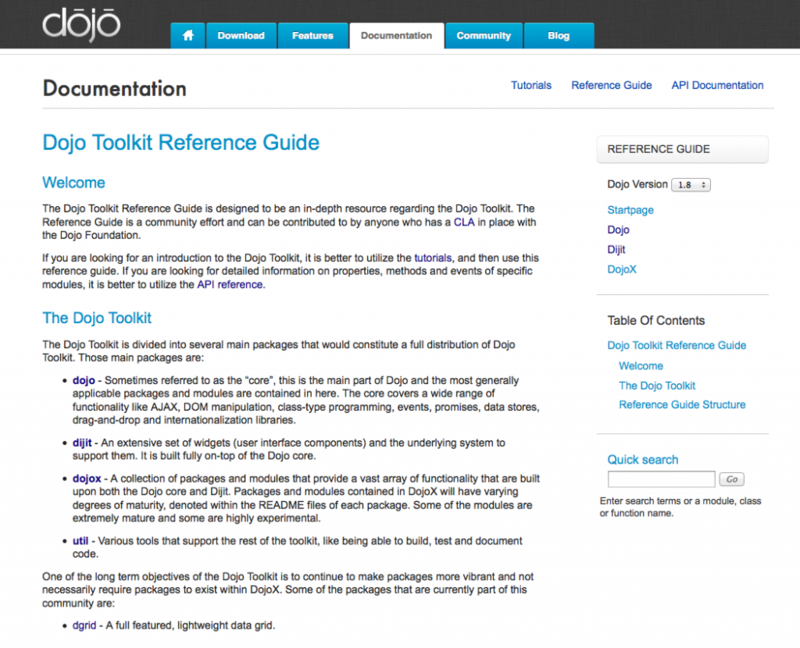 This release would not have been possible without significant contributions from the Dojo team. Special thanks to Colin Snover, Bill Keese, Dylan Schiemann, Rawld Gill, Ken Franqueiro, Bryan Forbes, Kitson Kelly, Brian Arnold, Doug Hays, Christophe Jolif, Mark Wubben, Doug Hays, Yoshiroh Kamiyama, Kris Zyp, Patrick Ruzand, Adam Peller, Evan Huang, and dozens of others, and to IBM, SitePen, AltoViso, and Research in Motion for their generous contributions of development time and financial support. With that out of the way, let’s talk about what’s new in Dojo 1.8! We’re still in the process of updating the Dojo tutorial series to bring you the latest and greatest advice, but over 70% of our existing tutorial series have already been updated, with the remainder to be completed in the coming weeks. 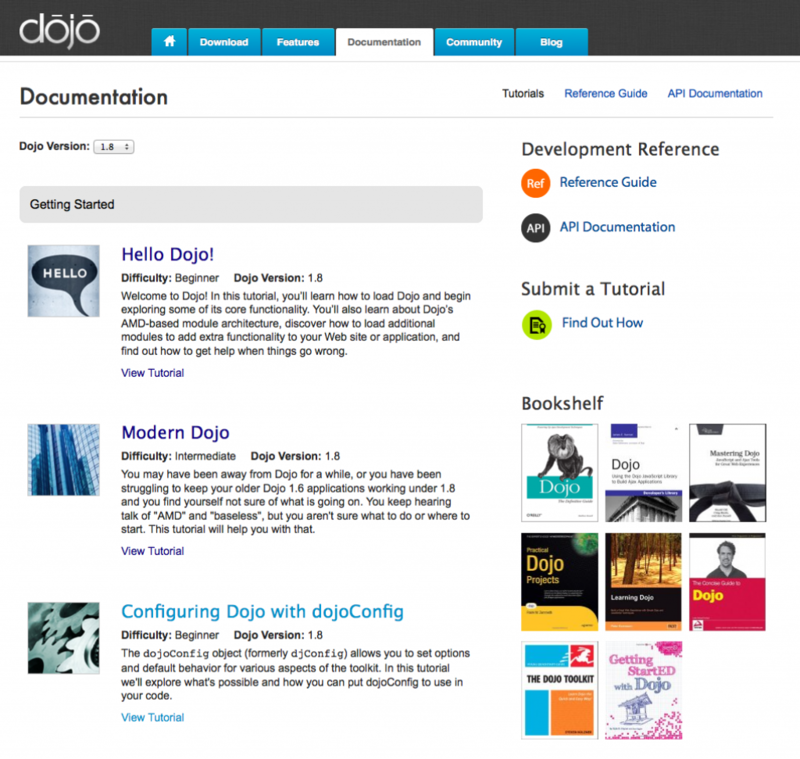 We’re also adding ten brand new tutorials to teach you about the new features added to Dojo 1.8. We’ll be announcing the remaining tutorials as they are released on our Twitter account (@dojo), so keep an eye out there. dojo/request: A cross-platform AJAX component, designed to be more flexible and extensible than the existing dojo/_base/xhr component (which it deprecates). Notable new features of this component include the ability to perform AJAX calls from Node.js, XHR2 support, and a mechanism for registering handlers to convert arbitrary response payloads into usable objects. dojo/node: A new loader plugin that enables server-side code to load Node.js/CommonJS modules from within the AMD loader. 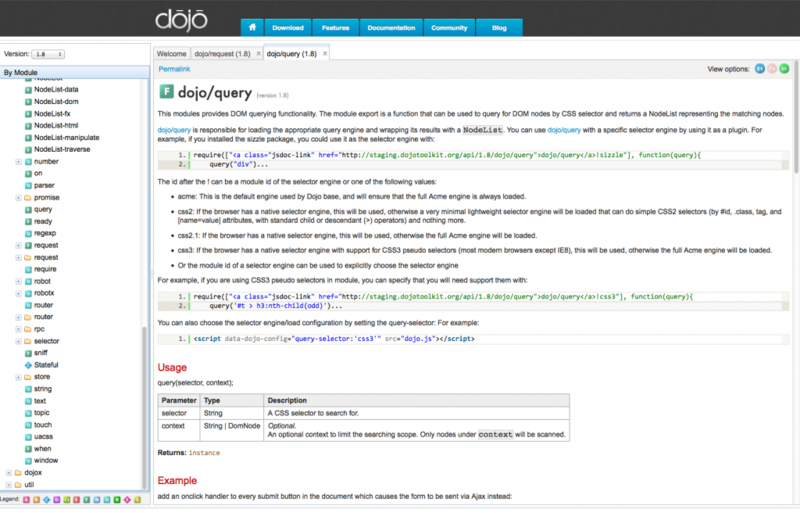 dojo/router: A component that enables client-side applications to register and navigate between discrete “pages” that change based on the current browser URL, like the navigation of a “traditional” server-side application. dojo/promise: A redesigned, Promises/A-compliant deferreds/promises implementation which deprecates dojo/_base/Deferred. Notable new features include improved instrumentation and error handling, an easier-to-use API, and a reduced footprint for applications that only need a subset of its features. dijit/Destroyable: A new base widget class that makes it easier to ensure event handlers, topic subscribers, and other connections are properly cleaned up when their owner objects are destroyed. 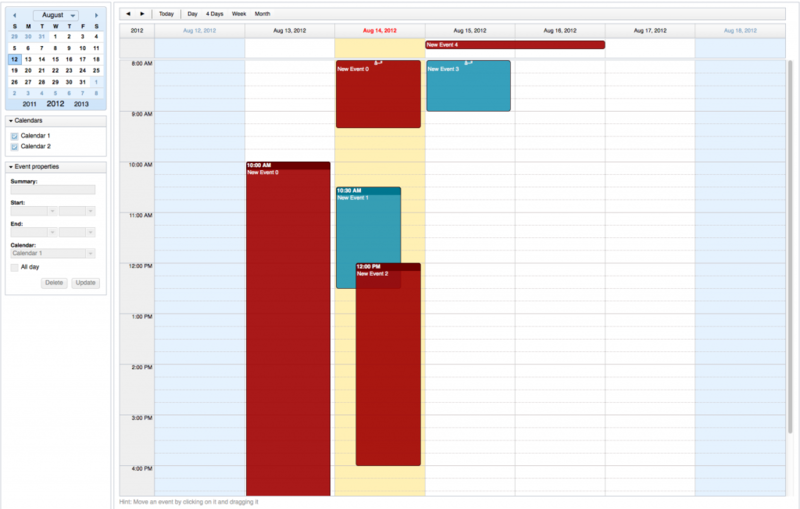 dojox/Calendar: A new, feature-rich calendaring widget that enables you to quickly and easily create event calendars. View a demo. dojox/dgauges: A new framework for creating graphically rich gauges used to represent and manipulate data. View a demo. 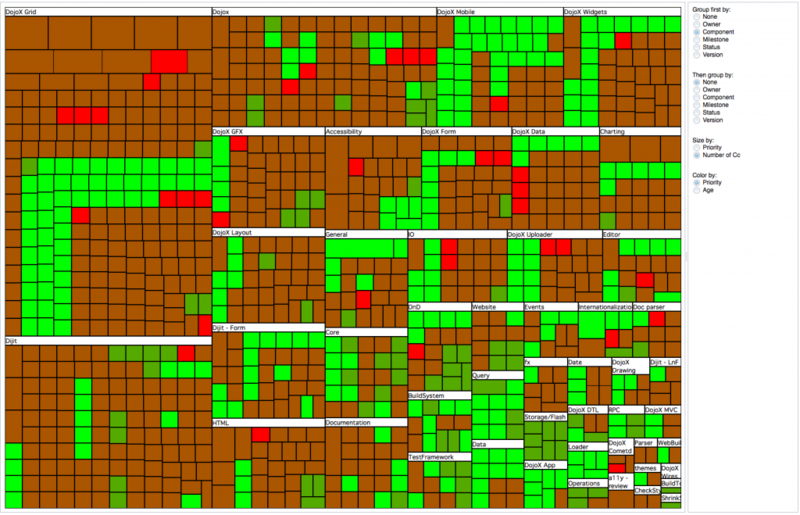 dojox/treemap: A component for creating treemap data visualizations. View a demo. dojo/dnd and dojox/gfx are both now fully functional on mobile devices. dojo/parser now accepts AMD module IDs in the data-dojo-type attribute. It also includes a new asynchronous mode that allows modules to be automatically required based on the data-dojo-type attribute if they haven’t been explicitly required yet. dojo/Stateful now allows the use of getter and setter functions; previously, only dijit/_WidgetBase enabled getter/setter functions. Dijit’s Claro theme now uses CSS3 gradients instead of images in browsers that support it. DOH Robot now works with the loader set to asynchronous mode. A more exhaustive list of new features and enhancements can be found in the Dojo 1.8 release notes, along with some migration instructions for any changes that are known to be incompatible with code written for Dojo 1.7 and earlier. The complete list of 971 new features, enhancements, and bug fixes can be found at the bug tracker. Now that we’ve released our “final” version of the Dojo 1.x series, we’re moving full speed ahead into planning for Dojo 2.0! In the meantime, we’ll continue to issue maintenance releases for all major Dojo versions 1.4 and later as necessary to ensure your apps continue to work well into the future. We’ll also be releasing a Dojo 1.8.1 release in the next 2–6 weeks to address any bugs that were introduced in Dojo 1.8. We’ll be providing more information on the blog shortly about our vision for Dojo 2.0 and how you can help to make it the best version of Dojo ever. We hope you’ll find Dojo 1.8 to be exceptionally stable and reliable. However, if you do run into any issues, please let us know by open a ticket. If you find a problem in the documentation, you can also provide feedback via the link at the bottom of every page. Otherwise, enjoy the release! Well, it seems there’s no such thing as a soft launch when it comes to open source software. 🙂 We’ve tagged the final code for Dojo 1.8.0 in our git and subversion repositories and submitted it to our CDN partners, but you won’t find it on dojotoolkit.org yet because we’re still finishing up some needed final updates to the site and documentation. In less than a week, on August 15, we’ll be officially releasing the latest version of Dojo, along with a raft of new documentation and detailed information on all the new features included in this release. In the meantime, hang tight, and we’ll be all set next Wednesday for the grand unveiling. Dojo 1.8.0rc1 is now available. It is expected that this will become the final version of Dojo 1.8 which will be released next week unless any critical issues are discovered during RC. Please test and report any issues at once.